With a strong draft coming up, the New York Knicks should look to build around rising star Kristaps Porzingis. That means trading Carmelo Anthony. Nine-time All-Star, 2013 scoring champion, 2003 NCAA champion. The highest scoring game at Madison Square Garden ever and a member of the infamous banana boat brotherhood (LeBron James, Dwyane Wade, and Chris Paul). 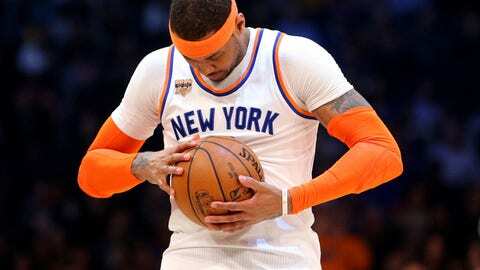 Carmelo Anthony has many personal accolades but there is one thing missing: a ring. NBA champion is a title associated with a lot of players, good or bad, but not with Anthony. Arguably the best scorer in the game in his prime, the 32-year-old seems to have fallen out of a good limelight and landed in a bad one. The “super team” New York Knicks haven’t looked super at all. Sitting at 22-31 and 12th place in the weak Eastern Conference, the “Jackson Five” have failed to show any signs of life despite being just 2.5 games back of the last playoff spot. Anthony has been at the center of all of it, whether it be isolation plays at inopportune times, lackluster defense, or inefficient shooting performances. Anthony’s numbers on the year: 22.9 points, 2.9 assists, and 6.0 rebounds per game. Those look like All-Star numbers, right? Yet, he has been excluded from the All-Star Game in favor of Giannis Antetokounmpo, DeMar DeRozan, and others who are on the better, winning teams. The “super team” of Rose, Courtney Lee, ‘Melo, KP, and Noah seem to not be working out, with Anthony’s contract still having two years on it. With a no-trade clause, he has all the power to leave or stay. With Rose demanding a max contract at the end of the season, the smart thing to do would be to trade Anthony to a competing team for a couple of draft picks, playing the rest of the year out with Rose and Porzingis. New York could then let Rose walk, thus clearing his contract and allowing the rebuild to begin around Porzingis. With New York’s own first-round pick, the Rockets’ second-round pick, the Bulls’ second-round pick in a strong draft class, the Knicks can surround Porzingis with some good young talent and build for the future. Must Read: What would the pros and cons be of trading for Austin Rivers? This would be the smartest option for the Knicks right now.